Running Press Kids, 9780762462124, 32pp. From award-winning author Stacy McAnulty comes a sweet story about love and what it's really all about. What is love? Can you only express it in fancy meals, greeting cards, and heart-shaped chocolates? Kids will find love everywhere in this delightful book. It can be found in everyday moments such as baking cookies with grandma, notes from Mom in your lunchbox, or a family singing together on a car trip, and it isn't always what you expect! 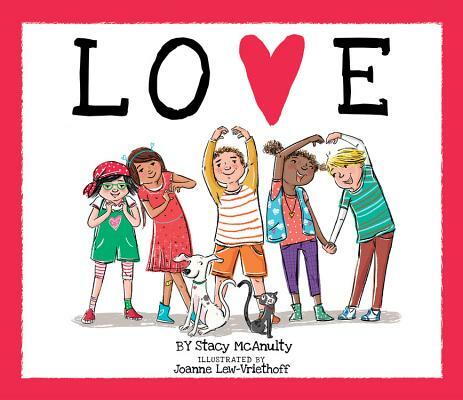 With delightful illustrations by Joanne Lew-Vriethoff and sweetly simple prose by award-winning author Stacy McAnulty, this is the perfect book to teach children what love means, why it's important, and how they can spread the love in their daily lives. Stacy McAnulty is the author of Mr. Fuzz Buster Knows He's the Favorite, 101 Reasons Why I'm Not Taking a Bath, Excellent Ed, Beautiful, and Brave. She lives in Kernersville, NC, with her family. Joanne Lew-Vriethoff is the award-winning illustrator of Beautiful and Brave, as well as such books as Another Day as Emily, The Dancing Pancake, and Peace, Baby! She lives in Amsterdam with her family.